This recipe creates a nourishing hair mask that’s great for all hair types. It will leave hair soft and silky. You can make your own hot oil treatment for your hair using a few ingredients you can find in your kitchen. 1 tsp to 1 tbsp of oil. You can use any type of oil, but some are better for different hair types. If you have normal hair, I like sweet almond oil or coconut oil. Oily hair? Try castor oil. 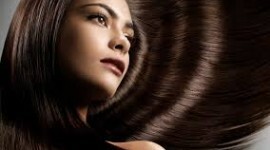 Dry or coarse hair will be best treated with jojoba oil or avocado oil. You can mix a couple oils . You can even use olive oil in a pinch! Essential oil.You can use 3 drops of chamomile oil. If you have dark hair, rosemary oil is lovely and sandalwood . Tea tree oil is wonderful for women with dandruff or itchy scalps. Carrot seed oil is amazingly moisturizing. You can skip the essential oil if you want. Infused herbs. Some women love to add herbs in the warming oil. Try a mixture of any of the following: rosemary, parsley, black tea or chamomile (take the leaves out of the bags). plate and heat it in the microwave for 5 seconds or till warm up but not hot. Add in the drops (never more than 3 drops of essential oils, ) and stir. If you are adding tea leaves or any infused herbs, add this to the bowl while heating it up. Once oil is heated, use cheesecloth or a coffee filter to strain. Separate hair into 4 sections — 2 up and 2 down — and apply the hot oil using a pastry brush to the bottom sections first. Once hair is covered, massage the hot oil into the scalp. Wrap your hair in plastic bag or shower cap . Follow this with a hot towel. Leave the oil treatment in for at least 30 minutes.